The revival of the complete knowledge of Vedic Aromatherapy, an aspect of Maharishi Vedic Medicine, brings us the ancient wisdom of one of the most natural systems of promoting holistic psychological and physical health and well-being. The essential oil present in the flowers, fruits, leaves, branches, seeds, root or rind of the plant is the ‘essence,’ ‘life force,’ or ‘soul’ of the plant. This innate intelligence awakens the inner intelligence of our mind and body. The essential oils are balancing and normalizing in their effect; they enliven the body’s own self-healing mechanism and restore life, health, and wholeness in body, mind, and soul. They can quickly uplift us, calm and relax us, motivate and inspire us, harmonize and balance our emotions, relieve physical symptoms of imbalances, and improve many basic physical and psychological functions. 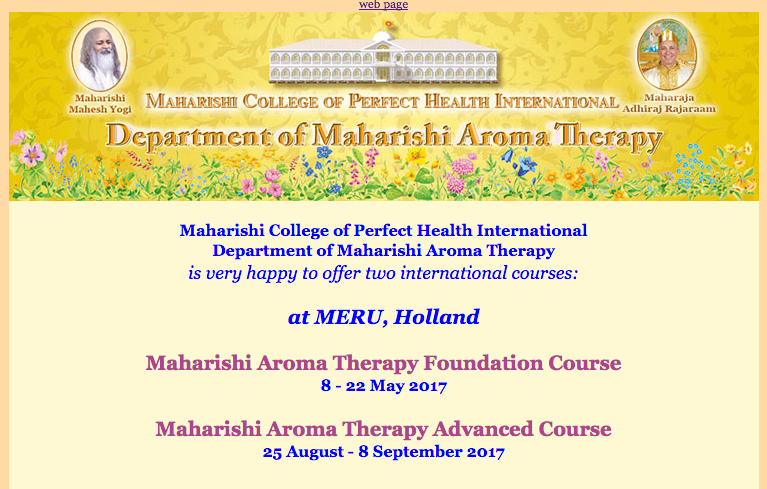 The Department of Maharishi Aroma Therapy of the Maharishi College of Perfect Health International in Vlodrop invites all those interested in the fascinating knowledge and experience of Maharishi Aroma Therapy to join these two beautiful courses. Note: To become a Maharishi Aroma Therapy Consultant you will need to take both of the following courses: first the MAT Foundation Course and then the MAT Advanced Course in which one learns how to conduct an MAT Consultation as well as deepening one’s knowledge of the use of the essential oils. This course is for all Meditators, Sidhas and Governors who want to know how to select and apply the specific essential oils to balance their doshas and to improve their own health and happiness as well as the health and happiness of their family members and friends. You will experience the powerful effects of the pure essential oils and learn how to apply them to significantly increase your physical, mental and emotional well being as well as to promote spiritual growth. You will receive a wealth of interesting knowledge about essential oils, their properties and applications, their history, chemistry, and existing scientific research including the unique EEG research with essential oils by Dr. Keith Wallace and Dr. Alarik Arenander. Note: If you are not already an MAT Consultant, then the MAT Foundation Course is a prerequisite for the Maharishi Aroma Therapy Advanced Course in which you will learn to give MAT Consultations. Those who have completed the MAT Foundation course and now want to become an MAT Consultant. MAT Consultants who want to deepen and expand their knowledge and become greater experts in helping their clients to live in better health and happiness. In this course you will learn or review how to conduct a Maharishi Aroma Therapy consultation and how to prescribe the appropriate essential oils and methods of application for balancing the ‘doshas’ and helping health conditions. In this course there will be more emphasis on the actual therapy with essential oils and its connection to Maharishi AyurVeda. You will receive more elaborated knowledge about essential oil therapies for a great number of imbalances. We will go deeper into the ayurvedic explanations of the doshas, subdoshas, dhatus, and gunas with regard to the actions and applications of the essential oils (including all our new 82 essential oils), the scientific documentation, and the explanation on how the essential oils work with regard to their chemical components and ayurvedic qualities. In this way we will cover the whole range of Maharishi Aroma Therapy from the gross physical to the most subtle energetic and spiritual levels. Both courses will be held in Maharishi’s Peace Palace at MERU Vlodrop (daytime) and at MERU Sint Odilienberg (evenings). • Begins 8 May with an evening meeting at 8:15. • Begins 25 August with an evening meeting at 8:15. • Ends 7 September after the evening meeting. Departure is on 8 September.